Hello citizens of Shattered Earth! Massive Awesome are not able to attend Gen Con in person this year (maybe next year..?) but to celebrate the general awesomeness of the event’s 50th anniversary we’re running a sale for its entire duration. 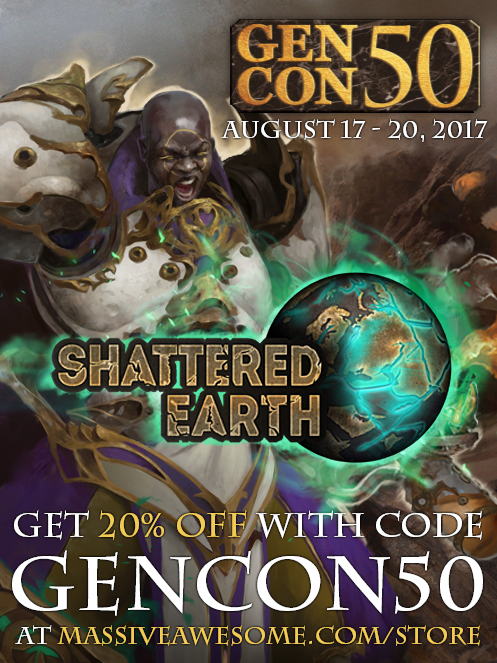 Using the code GENCON50 when shopping on our official webstore will enable you to enjoy 20% off any orders from midnight EST on the 17th through the 20th inclusive, whether bolstering your armies with additional units, buying a new faction, or just picking up a rulebook. We will also have some exciting news about the next step in the Shattered Earth journey coming very soon so keep your eyes peeled for that!